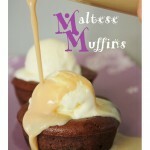 More spiced up desserts for the cold months ahead. 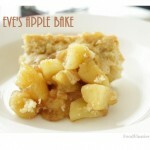 Today I give you a simple homey pudding of spiced apples and vanilla sponge called an Eve’s Apple Bake. It’s one of the first puddings I have ever made from scratch because it is so easy to do … although I still managed to screw it up (I was THAT bad at baking). Served with ice-cream or vanilla custard, this dessert will be 100% gratifying. As the month of Ramadhan leaves us, so it leaves a whole pile of dried dates sitting on shelves in supermarkets everywhere. 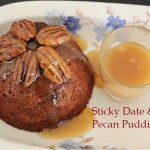 What better use for them than to whip up a little pudding and serve it with luscious homemade butterscotch sauce. Delightful!! Plus this recipe is done all in one blender for easy clean up. Never made brownies for myself before … well I have but never successfully. Here I am using yet another Alton Brown recipe because I figured all his recipes should be fool-proof; after all he is who he is for a reason. 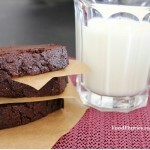 I also made a second brownie recipe ~ Peanut Butter Brownies for all those peanut butter lovers. This is a recipe courtesy of the very honourable Mr Alton Brown, a self professed chef-geek-mad-scientist and T.V-show-icon. 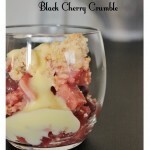 This dessert could not be any simpler to prepare, plus all the ingredients are all right there in your pantry already. So what are you waiting for? Go whip yourself up some of this decadence for you know that it can only be … “GOOD EATS!” (cue music). A beautiful French dessert made from such simple seasonal ingredients. 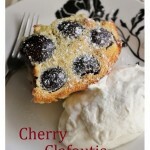 Traditionally from the Limousin region of France, this dessert is usually made from black cherries and a rich batter. Everything is poured into a well buttered dish and baked. To serve it should be lukewarm, sprinkled with sugar for added crunch. A scoop of vanilla ice cream wouldn’t be a bad idea either. The weather isn’t warming up at all here in the Netherlands. It’s been dull and rainy for days. My inner-self needs a lift, and what better way to lift and reinspire ones ailing spirit than with a dose of chocolate spiked with rhum for added warmth. 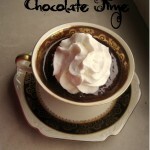 A luscious chocolate custard dessert ideally eaten solo, curled up on the couch in your jammies, with a good book. Rich and luscious, with a hint of nutmeg, this chocolate custard is anything but common. I like to serve this still warm accompanied with chocolate flecked biscotti for dipping. Warm, comforting and full of stoggey goodness … this old favourite deserves a mention on my blog for so many wonderful reasons. 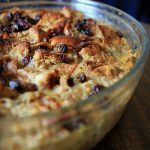 This recipe however is not your usual bread and butter pudding with sultanas and prunes. Things always taste better with chocolate, doesn’t it?? So here is my take on an old classic. 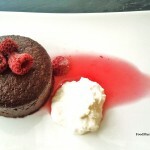 Chocolate Fondants with Crème Anglaise. I was thinking of a dessert to serve at a dinner party I am to be hosting at the end of the month. I wanted something quick and easy yet still had the WOW factor once it hit the table. This recipe fit perfectly and it ticked all the boxes. It’s cheap, easy, not fussy and it is awfully yummy. How can you argue with that? 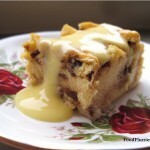 Serve with cold or warm custard or raspberry sauce and a dallop of cream … mmm! How can anyone refuse?